Update 2018: SBI has made some changes to their online portal, you can find the updated information on how to generate provisional certificate for your MaxGain account here. Everyone knows buying a house is not only an investment but also a smart way to save tax. There are various sections under income tax act to save tax in terms of principal repaid and the interest. Under this section, an individual can save tax on the principal repaid in the current financial year. The overall deduction is limited to 1.5 Lakhs which also includes employee provident fund, public provident fund, national savings certificates, life insurance premiums, tax saving fixed deposits etc. This section allows you to deduct the interest paid during the financial year from the taxable income. For self occupied property the limit is 2 Lakhs where for let-out property there is no limit. How to avail tax benefits? To avail tax benefits, declare your investments in the beginning of the financial year itself so that the TDS(tax deducted at source) would be same throughout the year. You need to submit the investment proofs to your employer at the end of the financial year, otherwise all tax benefits already availed would be deducted from your last month salary(some employers starts this activity in December and the difference is deducted from the salary for the month of Jan, Feb and Mar). What kind of proofs need to be submitted for home loan? You need to submit provisional certificate of your home loan account to avail income tax benefits under Section 24(b) and Section 80c. It should contain breakup of the principal and interest paid in the current financial year, otherwise your employer may reject your claim. 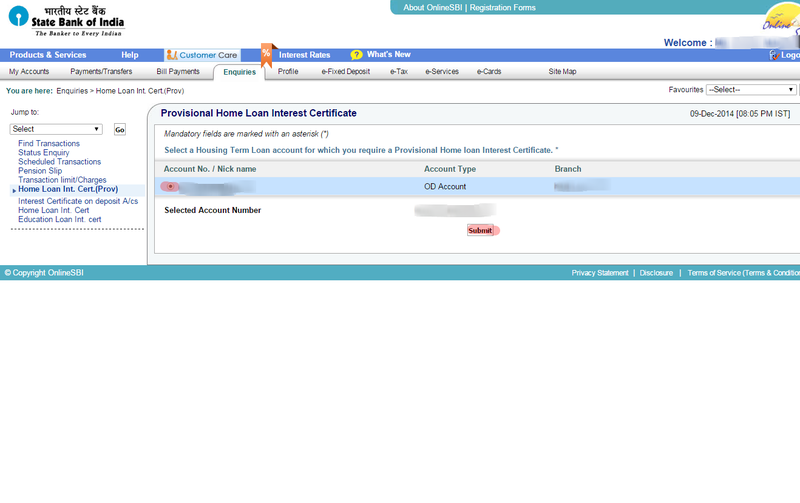 How to get provisional certificate for my SBI MaxGain loan account? One of the most popular home loan product from State Bank of India named MaxGain did not have an option to generate provisional certificate online but few weeks back SBI introduced this option in their online banking portal. Earlier, to get the provisional certificate, one had to personally visit the home branch. With the online option, by sitting at home, you can generate principal and interest paid certificate against your loan account, which can be submitted as an investment proof. How to generate MaxGain Provisional Certificate? On the left side you will see a link named Home Loan Int. Cert.(Prov). This link will take you to the home loan interest paid certificate generation screen. Click the link. Now select your home loan account(account type will be OD account - Over Draft account) and click the submit button. This will generate the interest paid certificate on the screen. Scroll down to the bottom and click on View/Download certificate in PDF Format and download the certificate in pdf format. That's it. Take a printout and submit it to your finance team along with other income tax savings proofs. Now in the comfort of your home or office you can generate the provisional certificate. Being a nationalized bank SBI has done a good job here, most of the banking features are now available online including opening PPF accounts! Let us know your feedback, feel free to post your comments below, we will get back as soon as possible. Many people reported they are not able to generate provisional certificate for their active O/D accounts, we strongly advise you to check with your home branch if you face any issue generating statement online. Update: From this year onwards PAN number of the financial institution from where you have availed housing loan is mandatory to get tax benefits from housing loan. You can find PAN number of State Bank of India here. You saved my day! 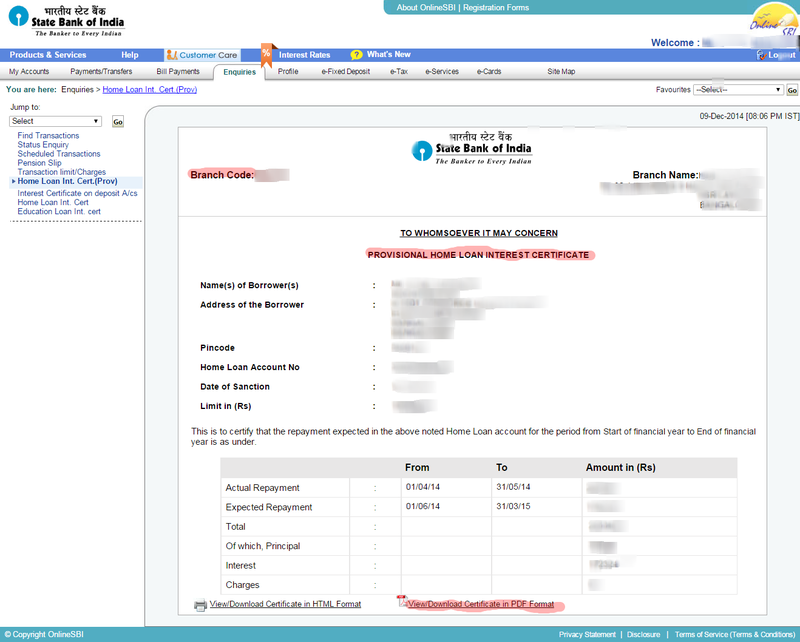 I was able to download income tax certificate of my loan account. Thanks much. You do not have any housing loan accounts. 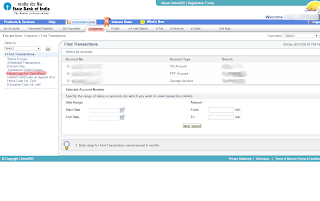 If you have a Maxgain account, it will not be visible here, but under Transaction Accounts. Housing Loan Interest Certificate for Maxgain is not available online. Agreed. there is no information mentioned about Principal. It is showing 0 for principal. how is that possible. Even for me it shows Principal as 0. Did you have a moratorium period for the loan. Is there a problem with the SBI online? Because, probably SBI has not disbursed the complete loan amount to the builder.. Agreed. Online certificate is not available for SBI MaxGain Customer. Just now I made a call to customer care as I am unable to find the e-certificate in online banking. The executive plainly and rudely replied that "this facility is not available for maxgain loan accounts. Thank you for calling". Please explain the meaning of expected repayment vs actual repayment and can actual repayment be less than expected repayment ? expected repayment is the expected repayment which would be done in the running financial year(total repayment from April to March) where actual repayment is the actual amount paid till the date of generation of the certificate. After the property is registered, you need to get an authorization letter from RACPC and submit it to your home branch(SBI). They will activate the OD a/c and will provide you the checkbook and other details. Once registered, OD a/c needs to be activated. This will be done by the SBI branch from where you have taken loan. Please check with your home branch. There seems to be a problem with the dates in the generated report. Even now (in the month of January) when I am generating a report, the "Actual Repayment" dates are from "01/04/2014" to "31/05/2014". (Expected would have been from "01/04/2014" to "31/12/2014"). My employer/finance team wants it to be "till date" and rejected the certificate. Anybody else encountering the same issue? Thanks Rajesh. Seems to be a one off problem for me then. Will visit the branch. Thanks. I can download the certificate, but it shows "principal" is "0". Is this correct for a maxgain OD account? and how to get preEMI statement? For pre-emi principal amount will be zero. Thank you so much for step by step guide. This really helps and save a lot of time !! it does not show for the previous financial year. i want it to calculate the pre-emi interest payment to claim 20% each year for 5 year. Hi.. For the current financial year from when the max gain provisional certificate will be available? For example : The financial year 2015 - 2016 has been started already but still I am able to see only the certificate of the previous year 2014 - 2015 . When I ll be able to download for the current year 2015 - 2016 ? BY end of the year, maybe by November or December. By the time you need to submit IT proof. In some companies they want the proof at the time you declare the investment, which We are not able to do and out tax is getting deducted. Is there anyway or solution for it ? Can i download the provisional loan statement online for the year april 2015 - march 2016? I need to submit provisional certificate for FY2015-16. Can I get that online. Can I download the Provisional IT statement for FY2015-2016 online? Apparently, this option is not available on SBI net-banking portal, whereas ICICI does have it! WE NEED TO SUBMIT PROVISIONAL CERTIFICATE FOR HOME LOAN AT THE BIGINING OF THE FY.BUT THIS IS NOT AVAILABLE ONLINE PLUS THEY ARE NOT PROVIDING THIS AT THE BRANCH ALSO >>>HE GAVE ME AMORTIZATION TABLE INSTEAD WHICH IS REJECTED BY MY A/C DEPT.WHY THIS CONFUSION ? SBI IS BOUND TO PROVIDE THIS CERTIFICATE. Yes, The Prov home loan certificate available on SBI site is for 14-15, However they have mentioned that "repayment expected" but finance approvers are not efficient to approve and they are asking for Prov Certificate for 15-16. May be they are right but SBI is unable to provide it and ultimately We have to bear the loss of tax saving. I do not any solution of it. Even if that certificate will be get generated at year end, I am not sure how and how much it will be helpful. Its the year end when you need to submit the final income tax proofs to your employer. Employer is asking for the proof early to calculate the TDS amount, the declaration can be modified later. When can we get the Home loan provisional certificate (current FY 2015-16) for SBI maxi gain account?. It can be created in the month of April every year. This will help to submit the certificate to employer in the beginning of the year. Any SBI official can reply for the same.. I downloaded PDF version of this Home Loan Int Certificate for (FY 14-15) But it says "** This certificate is required to be sealed and signed by the branch **"..!! Is it not acceptable without signing? Do we still need to visit the branch? and what's the use of this heck of a pdf..!!?? They Changed the option to download the Housing Loan Interest Certificate (Prov), please go to the following path once you logged in to Internet Banking. Do you have maxgain accnt? I am having the max gain account and completed all formalities with bank and got the transaction rights as well. but still not able to download the interest certificate. from bank they are tellling, for maxigain certificate needs to take from bank only. could you please clarify on this? Our flat is registered this year (August) and we went and submitted all the documents to RACPC. When I tried to download, Home Loan Int.Cert it throws an alert as, "Home Loan Interest Certificate for the previous financial year is not available for the account selected by you. Provisional Home Loan Interest Certificate for the current financial year is now available under the link Home Loan Int. Cert. ( Prov)." 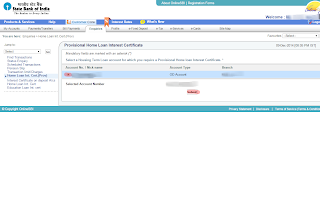 But, I am able to download Home Loan Int.Cert (Prov). Is it mandatory to submit the document given at RACPC to our SBI home branch - I mean the loan account branch? Kindly help me here. It is mandatory to submit the documents at SBI home branch, home branch activates your OD account only after receiving those documents. Then only you can transfer funds to and from the OD account. Also they will provide you cheque book and Debit card if opted for them. Thank you Editor for the information. But, I am able to download Home Loan Cert (Prov) from SBI website. The data provided in this PDF can be used for my income tax declaration, right? Please mention your inputs here. Yes, you can use it. Try transferring a small amount from your savings account to O/D account and vice versa. If both are working, then your O/D account is active. My OD account is active. I deposited money into OD account and also withdrawn from it. But, I am still getting warning. Can others still download home loan provisional interest certificate ? The entire information mentioned in this page is not applicable for Max Gain account. For getting interest certificate of Max Gain home loan account, you need to contact the branch. As the branch never picks the phone, claiming they are busy, you must consider visiting the branch for the same. So as per you, the whole article and the comments are fake? Common, it is not working for you doesn't mean it won't for any! Check with your branch what's wrong with your account and don't mislead others. I am able to dep and wid money from OD account online but unable to generate prov ceritificate. So its not about OD account activation, there is some other option SBI needs to do from there end, can you please help understand that option which we need to request bank to activate. Prov. certificate. my SBI agent told be to mail the home loan branch , but the service of SBI is very worst , thus i will have to visit the branch only. Guys, anyone got clarity on how to get loan certificate yet? I check today 5 Jan 2016, it was not avaible for me ( Max gain account) , but it was there for my friend ( old loan ) i guess we need to get it activated...information in the site is right only if bank has activated/or enable this feature. Same here for me too :-( got the message " Housing Loan Interest Certificate for Maxgain is not available online." Thanks for the useful information. I downloaded the provisional certificate however It does not reflect the additional amount that I transferred to my OD account. the certificate is based on the EMI amount. and not what you actually repay. So do i need to attach OD account statement to claim the full income tax benefit or I need to do something else? Many many thanks to you for sharing this info and saving my day...!!! How do we really know what is the Outstanding Loan amount in the Max Gain ? The traditional (manual) Provisional Certificate used to have this option. Its not there with the online/downloaded version. Could you please help on the same ? I can able to download the Provisional certificate but Principal amount is showing "0". My complete loan is also disbursed. What to do to get principal amount too on provisional certificate. I AM ALSO TRYING TO GENERATE PROVISIONAL CERTIFICATE FOR 2016-2017 BUT THE SAME IS NOT AVAILABLE. AT ONLINESBI CERTIFICATE FOR 2015-2016 IS AVAILABLE. cAN ANYONE TELL WHEN CERTIFICATE FOR 2016-2017 WILL BE AVAILABLE OR I HAVE TO GO TO THE BRANCH AND COLLECT THE SAME. Hi, I still could see Home loan interest Provisional form for the year 2015-16 in Enquire tab. Please let me know when Home loan interest Provisional form for the year 2016-17 will get updated? I still see the Home loan interest provisional for the year 2015-2016. Please let me know when the letter for the year 2016-2017 will be available? I've MaxGain account. I also submitted provisional certificate. Based on which employer has deducted my income tax. Now, when I calculate actual interest paid, it is less than mentioned in the provisional certificate. e.g. in provisional certificate it is Rs. 1,47,000. whereas in actual interest certificate it is Rs. 89900.00. So here my question is, while filling IT return do I need to mention 1,47,000.00 or 89,900.00. If I mention 2nd amount then I need to pay more tax. I have maxgain account. I booked a flat in 2013 as under construction. I shifted to this flat in October 2015. Can I get previous years _i.e. 2013/14, 2014-15, 15-16) Interest certificates online? or is there any way to get it? kindly guide. SBI Generates the OD Provisional Interest Certificate at the end of the Quarter[Not sure if it is only 1st quarter or all quarter]. So any one having new OD will get the certificate after the Quarter end. In my case I got the Certificate on 24th of April 2016. And my MaxGain OD account was opened on 28th Jan 2015. "Provisional Home Loan Certificate is not available for the selected account." Can anyone please advice? My loan account is OD Max Gain and loan is not yet fully disbursed. 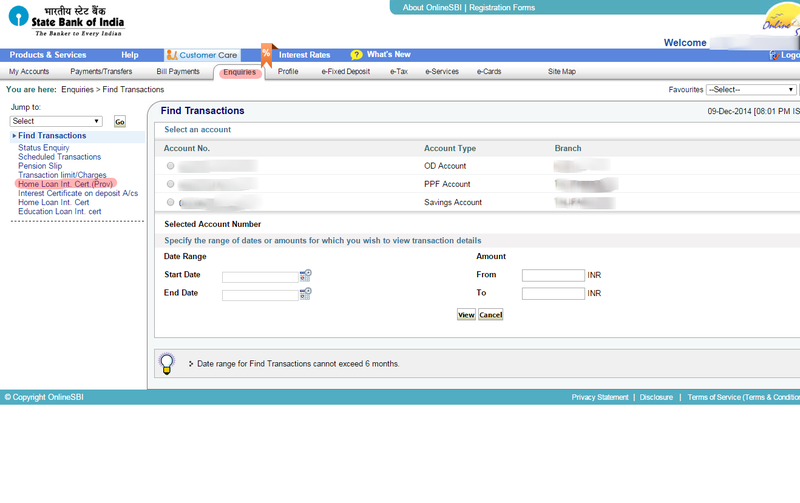 I am paying Full EMI and I have full transaction rights means I can transfer to/from my OD account. I am also facing same error "Provisional home loan certificate is not available for the selected account"
Please guide us if it is solved. how u solved this issue Prashant? For SBI MaxGain Home loan (OD account) accounts ,there is no option to generate Home loan Interest certificate or Provisional certificate online. This is because the Banking software treats the MaxGain as an overdraft account and not as Home loan account.It says there are no Housing loan accounts present when we try to generate the Interest certificate. The OD account is activated i.e. I can move in and move out money from the account.The loan amount is fully disbursed. Still if anyone is there who is having SBI Maxgain Home loan and able to generate the Interest certificate online?If so what needs to be done? 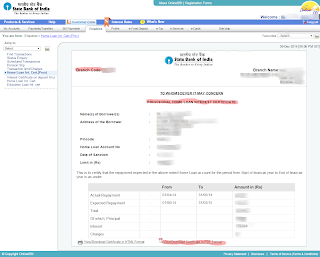 Is there any thing that can be done to report this to SBI and rectify this issue in their banking software ? This article is all about generating interest certificate online. If you are not seeing that option, check with your branch, they will have to activate it. Online statement showing total repayment for year 2015-2016 but the amount is not equal to 12*EMI. Is there any more calculation for total repayment. I have paid all EMIs in that year. I visited branch to get the correct statement. Also raised a complaint to correct the Software for online statement. Thanks a lot buddy. I really appreciate was able to download it. You saved me from going to bank. I want provisional int certificate for 2017-18 as I need to submit to my office before 30 April. But it generating only for 2016-17 while other private banks are providing. You may collect it from branch. For online generation it will take some time. I have a question to ask - I have done some partpayment for my Home loan principle through online . While I try to download the prov certificate for income tax , it dosent reflect the repaid amount . Can some one help ? Unfortunately, provisional certificate generated online never shows the correct numbers :( They use your initial EMI and disbursed amount, pre-payment is not considered at all. for me its not showing my "MC SBI HL MAXGAIN" account so i am unable to download interest certificate. Can anyone help. Its not true. its giving error as Home Loan account statement is not available for the selected account. Maxgain won't be available under "CERTIFICATES Section", just follow the article and download the certificate. Good luck! Same issue for me also, for maxgain account the specified option is not working. It is telling you don't have any loan account. Actually SBI online portal UI is upgraded, in this new portal it is not working. Last year for my maxgain account i have downloaded the interest certificate under above mentioned option (Enquirers). Now by no way i am able to download the certificate :( :(.. Initial thread killed so much of time. I should have directly come to the last. Thanks Rapunzel. e-Services -> Certificates -> -> Select OD account and then bang you are in the page. First paragraph of this article has the link to updated steps to download the interest certificate. Do you know when do they update the certificate for next financial year ? when can i get provisional certi. for the fy 18-19 ?